Visit the beauty of Lonavala at its best!!! Culture of India are its caves. The Karla Caves or Karle Caves or Karla Cells are a complex of ancient Indian Buddhist rock-cut cave shrines located in Karli near Lonavala, Maharashtra. The shrines were developed over the period – from the 2nd century BC to the 5th century AD. The oldest of the cave shrines is believed to date back to 160 BC, having arisen near a major ancient trade route, running eastward from the Arabian Sea into the Deccan. Karli's location in Maharashtra places it in a region that marks the division between North India and South India. Buddhists, having become identified with commerce and manufacturing through their early association with traders, tended to locate their monastic establishments in natural geographic formations close to major trade routes so as to provide lodging houses for travelling traders. Today, the cave complex is a protected monument under the Archaeological Survey of India. 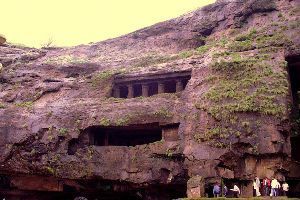 The caves were historically associated with the Mahāsāṃghika sect of Buddhism and later with Hinduism, which had great popularity in this region of India, as well as wealthy patronage. The caves house a Buddhist monastery dating back to the 2nd century BC. The monastery was once home to two 15-meter grand pillars. Now only one of these remains, and the remaining space is occupied by a temple dedicated to the goddess Ekveera, who is worshipped most notably by the Kolicommunity of mumbaiThe main cave features a large, intricately carved chaitya, or prayer hall, dating back to the 1st century BC. This is among the largest rock-cut chaityas in India, measuring 45 metres (148 ft) long and up to 14 metres (46 ft) high. The hall features sculptures of both males and females, as well as animals such as lions and elephants. Within the complex are a great many other carved chaityas, as well as viharas, or dwelling places for the caves' monks. A notable feature of these caves is their arched entrances and vaulted interiors. The outside facade has intricate details carved into it in an imitation of finished wood. The central motif is a large horseshoe arch. There is an Ashokan pillar at the front, with a closed stone facade and torana in between. The caves are 400 feet above the village of Bhaja. The inscriptions and the cave temple are protected as a National Monument, by the Archaeological Survey of India per Notification No. 2407-A. It belongs to the Hinayana Buddhism sect in Maharashtra. The caves have a number of stupas, one of their significant features. The most prominent excavation is its chaityagrha (Cave XII), demonstrating prototypes of wooden architecture and a vaulted horseshoe ceiling. 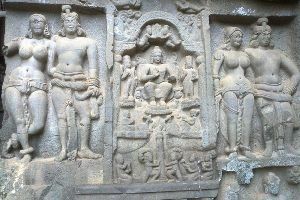 Its vihara (Cave XVIII) has a pillared verandah in front and is adorned with unique reliefs. These caves are notable for their indications of the awareness of wooden architecture. The carvings prove that tabla – a percussion instrument – was used in India for at least two thousand years. 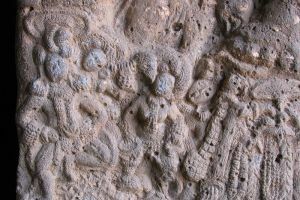 The carving shows a woman playing tabla and another woman, performing dance. The Bhaja Caves share architectural design with the Karla Caves. Chaitygraha has some Buddha images. A cistern inscription shows the name of a donor,MaharathiKosikiputaVihnudata, from the 2nd century AD. A wooden beam records two more inscriptions datable to 2nd century B.C., which indicates caves have been there for at least 2200 years. Eight inscriptions are found in the caves, some giving the name of the donors. Near the last cave is a waterfall which, during the monsoon season, has water that falls into a small pool at the bottom. These caves also provide important proof regarding the history of the Tabla, an Indian percussion instrument, since carvings from 200 BCE show a woman playing tabla and another performing a dance. Lohagadis one of the many hill forts of Maharashtra state in India. Situated close to the hill station Lonavala and 52 km (32 mi) northwest of Pune, Lohagad rises to an elevation of 1,033 m (3,389 ft) above sea level. The fort is connected to the neighboring Visapur fort by a small range. The fort was under the Maratha empire for the majority of time, with a short period of 5 years under the Mughal Empire. Lohagad has a long history with several dynasties occupying it at different periods of time: Satavahanas,Chalukyas, Rashtrakutas, Yadavas, Bahamanis, Nizams, Mughals and Marathas. Shivaji Maharaj captured it in 1648 CE, but he was forced to surrender it to the Mughals in 1665 CE by the Treaty of Purandar. ShivajiMaharaj recaptured the fort in 1670 CE and used it for keeping his treasury. This fort was used to keep the loot from Surat. Later in Peshwa time Nana Phadnavis used this fort for living for sometime and built several structures in the fort such as a big tank and a step-well. The fort has been declared as a protected monument by the government. Lohagad is part of the Western Ghats. 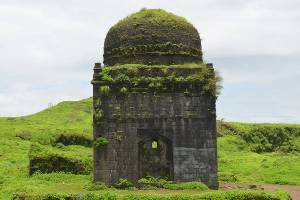 It rises to an elevation of 1,033 m (3,389 ft) above sea level, and is located to the southwest of the larger Visapur fort. The range divides the basins of the Indrayani and Pavana rivers. Lohagad overlooks the Pavana reservoir, located to the south of the mountain. The hill extends to the northwest to a fortified spur, called Vinchukata (Scorpion's tail) because of its resembling shape. 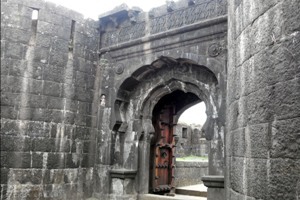 The four large gates of Lohagad are still in good condition and reasonably intact. 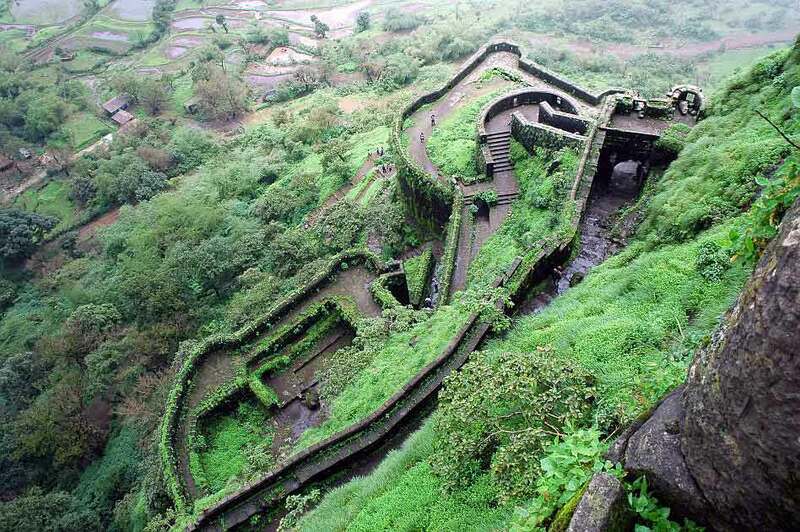 During the monsoon, the top of the fort is covered with mist and clouds and becomes particularly wet with growing moss. The roads and trails leading to the hill are quite slippery at this time of the year and precautions are necessary to be taken while venturing the routes.